My Mom’s parents came from Hungary and she wanted to be “American”, so only English was spoken at home when my brother and I were growing up. Mama didn’t learn English until she was in the third grade. I suppose she later understood the importance of knowing the language. In spite of that, my mom would, on occasion, prepare Hungarian dishes. 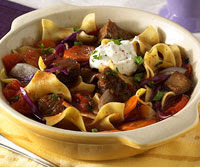 I never liked Stuffed Cabbage, but the Goulash, which is how “Gulyas”, the Hungarian word is pronounced, was special. Gulyas actually means “cowboy” and gulyasleves means soup of cowboys. Hungarians use lard often and some people today are repelled by its use, but it does add authenticity to the dish and you could substitute vegetable oil for it. My mom’s gone now but this dish is a link to her. Even select restaurants in Budapest serve this rustic dish. I hope you will try this hearty goulash soup; there are no tomatoes in this reddish stew, the paprika and the long cooking of the beef chuck impart a wonderful flavour to the gravy. Some people put a chopped dill pickle in the pot but it’s optional. Melt lard in a dutch oven, add beef and stir. As the beef browns, add onions and fry until both are well browned. Put in all the ingredients except the peppers, potatoes, sour cream and noodles. Simmer for 3 hours, check the liquid and add water if necessary. 30 minutes before the time is up add the potatoes to the soup. 10 minutes before the 3 hours is up, add the peppers. A kitchen timer facilitates al of this. When done, serve over egg noodles and top each serving with sour cream. If you like beef stew, you will certainly enjoy this earthy ethnic specialty. I like beef stew so I just might like this. It sure looks good and the ingredients look delicious. I love goulash...and Hungarian stuffed bell peppers! Thanks for sharing. Gulyas Leves is one of my favorites. I love to make when we go camping, we cook it over the wood fire and the smoke makes the gulyas fantastic. The photo you posted is great. Thank you for sharing your recipes and your stories and thank you for the sweet comment on my blog.